These next couple of months will be very special and hectic for Slade. 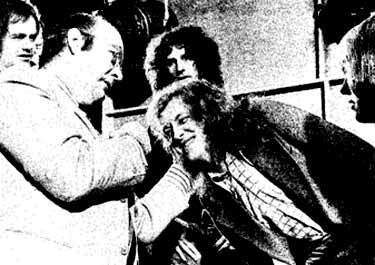 After the monster hit 'Far Far Away' saw the release of Slade in Flame'. This month sees the Slade poster magazine 'Slade in Flame' on the newstands, the return of Slade them¬selves from a very successful European Tour and then straight into the TV studios to do all those Christmas Specials on ITV and SSC. Then in January the paperback book of the film will be published, the release of the film itself closely followed by a tremendous Slade single. So you can see from the above, Slade will be extremely busy one way and another. It has come to my notice that a few magazines have been printing the wrong information about the fan club. The correct information is included in the leaflet enclosed with this Newsletter. The magazines concerned have apologised and promise to print the correct facts about the fan club. When writing in to inform me about your change of address please include your membership number, as this makes my job that much easier. Thanks! I'm sorry to report that I have completely sold out of Slade radios. The same goes also for the Slade poster which was obtainable through this address. The only posters now available are from Just Posters. If you have mislaid your previous Just Posters application form just send me a s.a.e. asking for one and I will send it as soon as possible. You may have remembered in a back issue of the Newsletter, news of a Slade mag, which was to have been available through newsagents. I am afraid that because of production difficulties, completely out of our control, this publication had to be cancelled. Talking about magazines, the 'Slade magazines, the 'Slade in Flame' poster magazine is now available at your nearest newsagent. After the very successful filming of 'Slade in Flame' at the Rainbow Theatre in September, there was to be another film¬ing there in October. This was for a different scene but because of technical difficulties and the fact that they could not arrange a film crew for that day, we had to cancell it. The boys wish to apologise for the disappointment caused, and hope that seeing the film on the screen will make up for it. I've had a few enquiries from members about an album called 'Coz I Luv You'. This album was only released in Europe and I'm sorry to say therefore, is unobtainable in this country. FLAME traces the story of a rock band's gruelling struggle to stardom, their brief span of success, and subsequent disintegration due to external pressures and internal conflict. Treading the boards of the north country are JACK DANIELS AND HIS D.T. 's, a second-rate band working a third-rate audience, with a fourth-rate agent creaming 10% CHARLIE (Don Powell) auditions for the job of drummer, joining BARRY (Dave Hill). and PAUL (Jimmy Lea). JACK DANIELS (Alan Lake) monotonous circuit of north country clubs, aided by BARRY's sometime girl friend, ANGIE (Sara Clee). and managed by a small time crook of fading hopes, RON HARDING (Johnny Shannon). 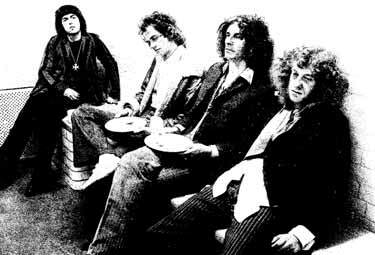 The group's venues bring them into contact with a rival outfit, ROY PRIEST AND THE UNDERTAKERS, a quasi rocky horror band starring STOKER (Noddy Holder) as lead singer. DANIELS sabotages The Undertakers' performance by locking STOKER in his stage coffin in the middle of their act. A chase ensues, culminating, in a bizarre fracas which lands both groups in jail. 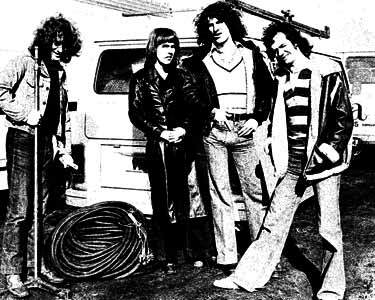 PAUL and STOKER, the composing elements of their two respective bands, wind up in the same cell, and following their release the group reform as THE IRON ROAD -- with STOKER replacing DANIELS, and involving BARRY's old school mate, RUSSELL (Anthony Allen). as their unpaid roadie. 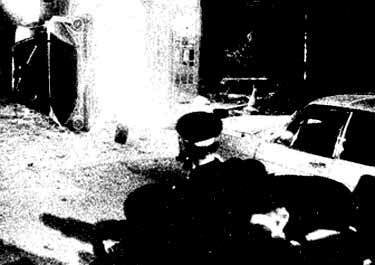 The group's debut at a local dance hall ends in near disaster when a violent clash develops between HARDING and STOKER. HARDING has never looked upon the group with much enthusiasm and uses the incident as a convenient excuse to drop them from his catalogue of dubious talent. However, their efforts have been noted by TONY DEVLIN (Ken Colley). working on behalf of a successful London advertising executive, ROBERT SEYMOUR (Tom Conti). After initial testings SEYMOUR has the band brought to London where he proceeds with much the same methods as he applies to cigarettes. The group are polished, groomed, fitted, dressed, and finally launched as FLAME on an unsuspecting public. The publicity programme is given a boost when the group be­ come involved in a pirate radio attack in the Thames estuary, and their subsequent rescue brings them nationwide attention. FLAME's growing success has also been brought to the attention of their former manager, HARDING. He resurfaces at a celebration party to inform SEYMOUR that the group are still under contract to his agency. SEYMOUR arranges for the offending document to be discreetly removed from HARDING's office and continues undeterred. HARDING tries to threaten the contract on SEYMOUR's behalf and has him beaten-up. SEYMOUR growing conflict between STOKER and PAUL, and while HARDING struggles with SEYMOUR for control, the group begins to slowly disintegrate. In addition to the creative conflict, they are becoming in creasingly disillusioned with the life they are forced to lead. A nationwide tour is launched but despite FLAME's success SEYMOUR is pressurised by his backers to either come to terms with HARDING or else pull out. Realising that the group themselves will shortly break up, SEYMOUR finally agrees. On the last night of the tour he returns home to call HARDING only to find he's too late. HARDING has sent in his operators to desecrate his child's bedroom. The following morning, HARDING arrives at the group's hotel to inform them of their return to his agency. He too left empty­ handed: STOKER blandly tells him that FLAME no longer exists. Filmed in Panavision and Colour, with an original score by SLADE, FLAME will engender the audience with the feeling of having participated in what might have been a slice of a pop band's own life. ALBUM - The album Slade in Flame was released on 29th November - it was scheduled for the 22nd., but Polydor could not produce enough copies to cover the advance orders in time. The album contains 'How does it feel', the theme song from the film, 'Them Monkees can't Swing' is the first number performed in the film by the group under the name of Iron Rod. 'So far so Good' - this is used in the film as the initial number one hit for the group, FLAME. 'Summer Song' is performed in the final sequence of FLAME as the villain of the piece turns up at the seaside hotel to try to force the group to return to his agency. 'O.K. Yesterday was Yesterday' - for those who like their SLADE with all stops out. 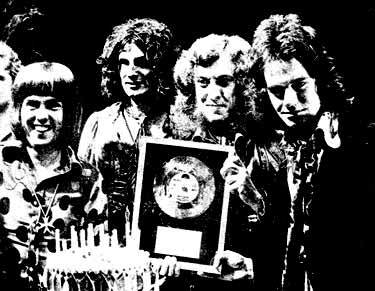 'Far Far Away' - already a monster hit as a single for SLADE bringing them a silver disc within two weeks of release. 'This Girl' - in the film there is another group, Roy Priest and the Undertakers, and they play this number - though in FLAME the lyrics differ from those in this album. 'Lay it Down' - used in the film as the background prior to the beating up scene. 'Heaven Knows' - a picked - guitar intro to this easy tempo song. 'Standing on the Corner' - strictly boot music, heavy instrumental backing laid down for Noddy Holder's cast-iron-Iung delivery. Once again, SLADE have achieved a Silver and Gold award for this album even before release date. BOOK - The book FLAME has been written by John Pidgeon, and is published by Panther in January, available from all Bookshops at 50p. There has never been a book which captured the sweaty ambience of the Rock business so authentically. Seedy clubs, dishonest managers, catastrophic fatigue, the painful clash of personalities and the cynical manipulation of the media. It's all here in a hard-hitting novel by an author uniquely well placed to tell it like it is. I'm writing to you from the depths of Europe .... Brr .... it's cold here and when visiting Norway, we actually saw some snow. The tour is very successful, but £4,OOOworth of dam­ age was done at one venue (the crowd got over excited). While we are on the subject of tours, there is talk about a British Tour in the summer which we are all looking forward to doing. Noddy, Jim and myself would like to apologise for the cancellation of the second filming at the Rainbow Theatre, but hope that seeing the film itself will make up for the disappointment. We all had great fun making the film and we would like to thank the behind-the-scenes-men for putting up with actors like us. As you all know, I had my hair cut specially for the film, and I must say I prefer it shorter, don't you? METHOD - Chop the onion finely and fry in the fat until it begins to go brown. Mix in the rest of the ingredients and stuff into the turkey. This is sufficient for a 201b. bird. I hope it's a success or else guess who won't be the most popular fellah around!! We have a limited number of Slade in Flame full colour T. shirts which we used in the promotion of the film. We have three sizes, large, medium and small and are only available to fan club members at £1.20p. which includes VAT and p. & p. When ordering, please mark your letters distinctly with the words 'Slade in Flame'. There are also Slade viewers which contain 20 colour frames of scenes taken from the movie. These are obtainable from me at 50p. plus 5p. postage and packing. Most of the colour pictures have never been seen by the public. So why not a glimpse of the action in store for you in Slades incredible film. Also available, but not from me but from newsagents, Slades own poster magazine 'Slade in Flame' which includes 3 full-size posters and articles by John Peel and Julie Webb. Available now at only 30p. All your illusions, all your confusion All left behind.